Obituary for Dallie A. Sotomayor | Arthur F. White Funeral Home, Inc.
Sotomayor, Dallie A., of Farmingdale, NY passed away on January 20, 2019 at the age of 79. 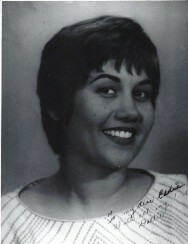 Beloved wife of Edwin O. Loving mother of Eddie (Donna), Lynda Helenek (John) and Cyndy Sotomayor (Chris Hassett). Cherished grandmother of Elizabeth (Alberto), Jennifer, Christopher, Julie and Isabelle. The family will receive visitors Wednesday, January 23, 2019 from 9 to 10:30 am at the Arthur F. White Funeral Home, Inc., Farmingdale. Funeral Mass Wednesday, January 23, 2019, at 11 am at St. Kilian RC Church. Cremation Private.